This dog, along with millions of other of homeless pets, needs a forever home. Help us Clear the Shelters. 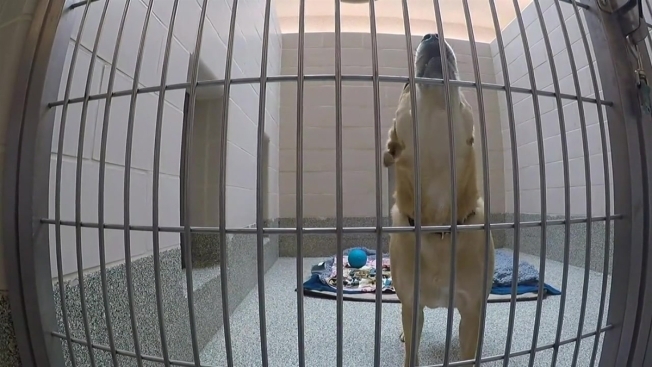 More than 2,400 animals were adopted around New England, and more than 45,000 now have forever homes, thanks the nationwide effort Clear the Shelters. NBC Boston producer Kathryn Shehade was one of the many who went to a shelter on Saturday and fell in love with a furry friend. Max the dog was waiting for her at the MSPCA's Nevins Farm location in Methuen, Massachusetts, and by the end of the effort, she decided she "couldn't leave him there." Meanwhile, in Portland, Maine, Stephanie Boulanger had had her eyes on a rescue dog, Daisy, at the Animal Refuge League of Greater Portland. "She's so happy and she makes me happy," she said. Gautier was also at the ARL of Greater Portland's shelter when his foster family decided to line up at the crack of dawn in order to adopt him -- forever. "We heard about the event, we fell in love with him, so we woke up at 5 a.m. this morning to come and adopt him," Janice Ribeiro said. Cats and dogs weren't the only animals to find forever homes on Saturday, either. Goats, pigs and even horses at Nevins Farm found new families through the Clear the Shelters effort. However, MSPCA officials say those looking for one of these animals need to be conscious of their special needs, like having a farm animal veterinarian available to help. Interested in rescuing a new furry friend? Click here for our interactive map to help you pinpoint the nearest participating shelter in your area. Spike came to the NHSPCA in Stratham, New Hampshire, after his owner died. 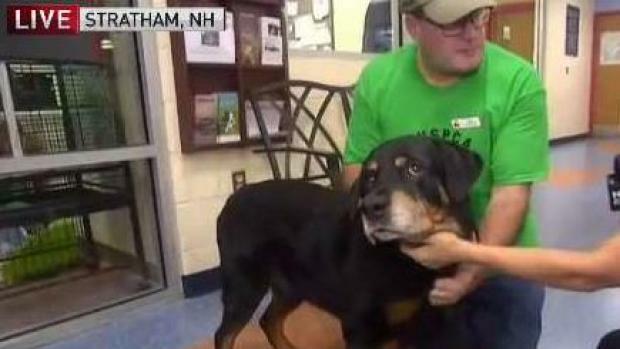 Now the 10-year-old rottweiler is looking for his new forever family. In addition to our livestream from the MSPCA-Angell in Boston, you can also watch live video of Clear the Shelters from across the country. Click here for more resources on what you should do after you adopt a pet, tips on prepping your home for your new family member, photos of our employees with their fur babies and much more.